“Thou wilt keep him in perfect peace, whose mind is stayed on Thee: because he trusteth in Thee“ (Isa 26:3). A simple definition for ‘trusting in God’ is stated in this verse. 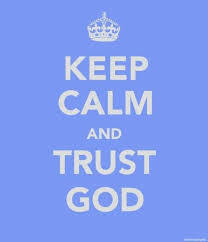 Trusting in God is, our mind staying on God. Noah found mercy or grace as he looked to the eyes of the Lord, and was able to live a perfect life in his generation. Some find it difficult to live a just and perfect life. As they do not look to the eyes of the Lord or trust in Him, they lack grace. When our mind stays on the Lord we receive the grace to realize our own emptiness, and God’s fulness. “God resisteth the proud, but giveth grace unto the humble” (Jms 4:6). Trusting in God, looking to the eyes of God for mercy, our mind staying on God, humbling ourselves – all these mean more or less the same thing. Perfect peace is another blessing we get from trusting in God. In the original, “perfect peace” is shalom shalom. ‘Shalom’ means peace, wholeness, completeness, good health, etc. It virtually means that if we trust in the Lord, we have a double (perfect) portion of His peace, good health, etc. Perhaps the most blessed text on the blessings we receive by trusting in the Lord, is Psalm 21:6,7: “Thou hast made him MOST BLESSED FOR EVER : Thou hast made him EXCEEDING GLAD WITH THY COUNTENANCE for the king trusteth in the LORD.” Consider the words ‘most’ and ‘for ever’. Those who trust the Lord are most blessed – now and in Eternity. No one can expect a greater blessedness, or blessedness for a longer period, than this. Those who trust the Lord are made blessed, yea, most blessed! And they that trust in the Lord are made glad, yea, exceeding glad with His countenance. SO THOSE WHO TRUST IN THE LORD ARE MOST BLESSED AND EXCEEDING GLAD PEOPLE, IRRESPECTIVE OF THE PROBLEMS THEY FACE AND THE BURDENS THEY CARRY. If so, those who do not trust in the Lord (but trust in the arm of flesh) are most miserable and exceeding sad people. “…for the king trusteth in the Lord”. Indeed, those who trust in the Lord are not ordinary people, but kings.